Email: is 20% getting through really a success? Over the weekend, I sent an email out to a lot of my contacts on LinkedIn. Because of the number of folks i’m connected to, I elected to subscribe to Mailchimp, the email distribution service recommended by most of the experts I engage in the WordPress community. I might be sad, but it’s been fascinating to watch the stats roll in after sending that email. 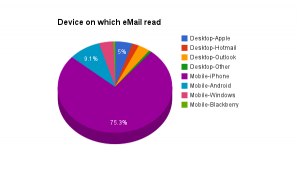 However, Mailchimp insert a health warning, saying that iOS devices do handshake the email comms reliably, whereas other services are a lot more fickle – so the number of Apple devices may tend to over report. That said, it reinforces the point I made in a post a few days ago about the importance of keeping your email subject line down to 35 characters – to ensure it’s fully displayed on an iPhone. All in, I was still shocked by the apparent number of emails successively delivered but not opened at all. Thinking it was bad, I checked and found that Mailchimp reckon the average response aimed into folks aligned to Computers and Electronics (which is my main industry), voluntarily opted in, is 17.8%, and click throughs to provided content around the 1.9% mark. My email click through rate is running at 2.9%. 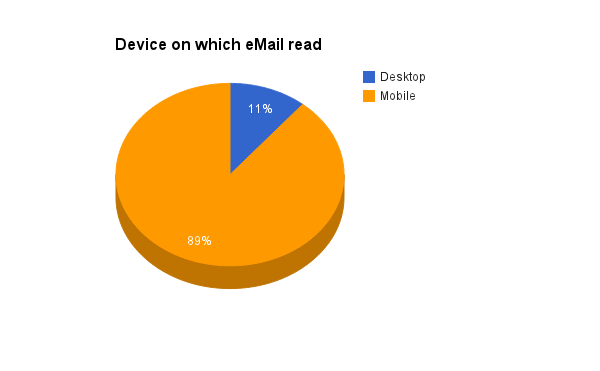 So, my email was 2x the industry norm for readership and 50% above normal click-through rates, though these are predominantly people i’ve enjoyed working with in the past – and who voluntarily connected to me down the years. So, sending an email looks to be as bad at getting through as expecting to see Tweets from a specific person in your Twitter stream. I know some of my SMS traffic to my wife goes awry occasionally, and i’m told Snapchat is one of the few messaging services that routinely gives you an indication that your message did get through and was viewed. Getting guaranteed attention of a communication is hence a much longer journey than I expected, and probably (like newspaper ads of old) relying on repeat “opportunities to see”. But don’t panic – i’m not sending the email again to that list; it was a one-time exercise. 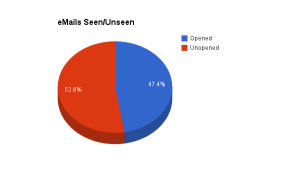 This is probably a dose of the obvious to most people, but the proportion of emails lost in action – when I always thought it a reliable distribution mechanism – remains a big learning for me.